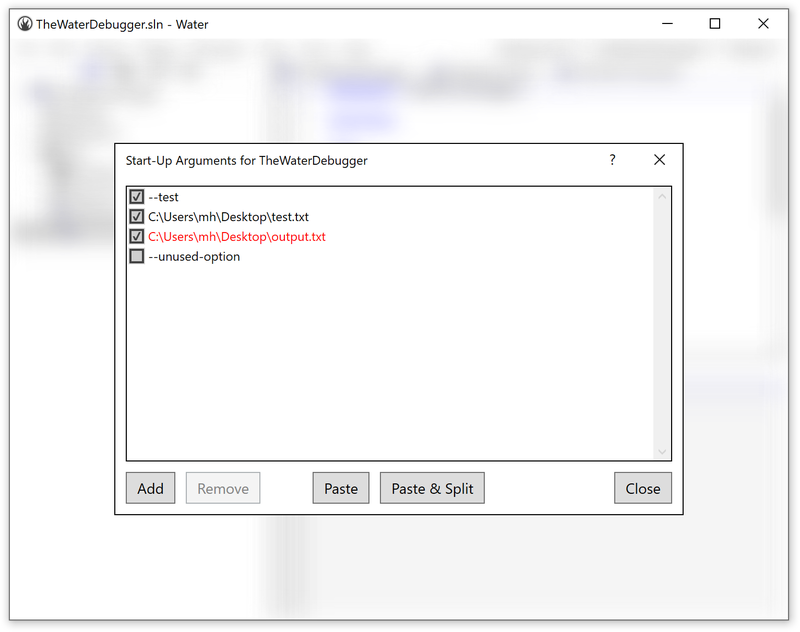 Fire and Water provide a powerful and flexible view view to manage the start-up arguments that will be passed to your application when debugging. This is especially helpful when working with command-line projects and testing various parameters. You can invoke the Start-Up Arguments Sheet by choosing "Project|Manage Start-Up Arguments" from the menu, or pressing ^⇧A / Alt+Shift+A. The main view of the Start-Up Arguments sheet consists of a list of any and all arguments you have set up to be passed to your application. Individual arguments can be checked or unchecked, and only checked arguments will be used. This allows you to flexibly switch between testing different options of your application. Your project will maintain a list of all arguments, so you can always easily re-enable them. Arguments are maintained per Project, and the Start-Up Arguments sheet will always show the arguments for the active project selected in the top right of the main window. You do not need to worry about quoting arguments with that contain spaces. Each line will be treated as an individual argument, and the IDE will automatically apply quotes to the as needed, depending on how your application is launched, and what the platform's rules for passing arguments are. You can paste arguments from the clipboard into the list using the regular ⌘V/Ctrl+V shortcut. If you have a full command line with multiple arguments on the clipboard (e.g. copied from a console window, or obtained from a user of your app), you can use the "Paste & Split" button to have it parsed into individual items. This will take into account quoted arguments. You can also copy one or more selected arguments using ⌘C/Ctrl+C. 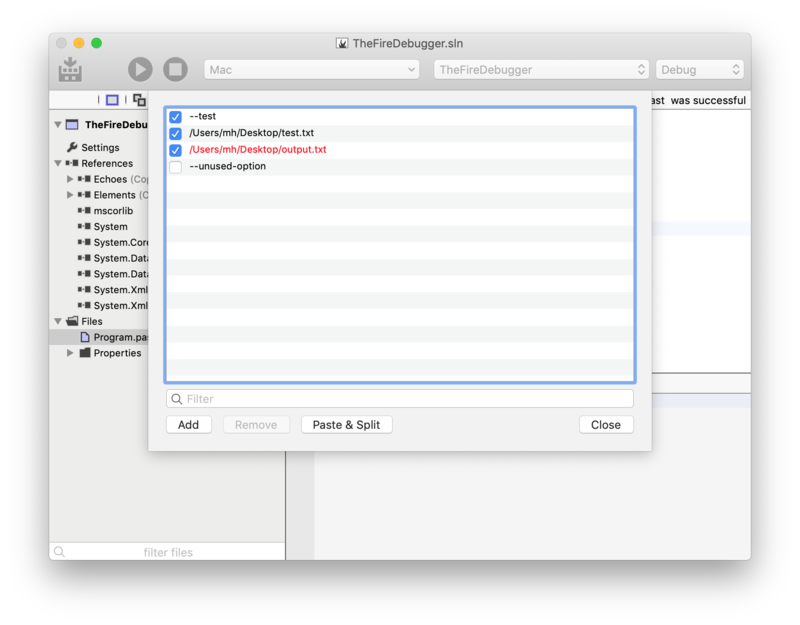 You can drag in files or folders from Finder or Windows Explorer (or any other source) into the Start-Up Arguments list to easily add existing files as parameters for your app. You can also (currently in Fire only) drag and drop arguments within the list to change their order. The Start-Up Arguments sheet will automatically detect arguments that look like (absolute) file paths (starting with / on Mac, or with a drive letter or \\ on Windows). If a file path points to a file that does not exist on disk, the argument will be highlighted in red, letting you spot unexpected typos.